HAWAIʻI ISLAND - There will be a partial lane closure of Hawaiʻi Belt Road in Kalōpā between mile marker 38 and 39 today, to allow crews to replace 15 damaged transmission poles. 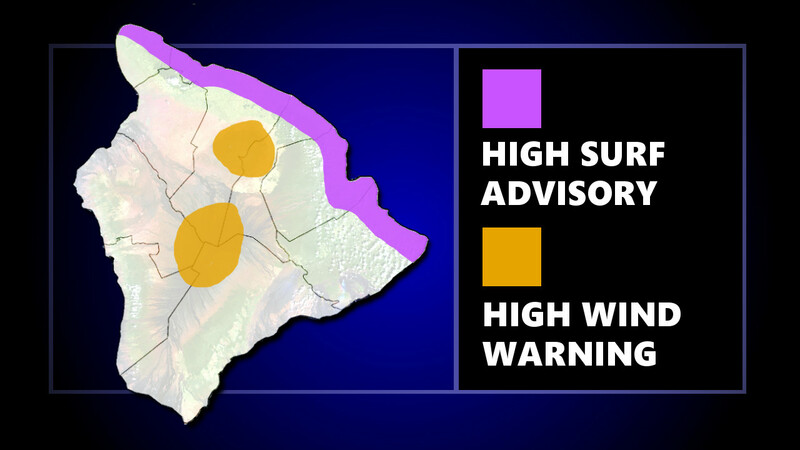 (BIVN) – A High Surf Advisory is in effect for north and east facing shores of Hawaiʻi Island, and a High Wind Warning remains in place for the summits of Mauna Kea and Mauna Loa on Tuesday. Crews are still working to restore power to areas of Hāmākua. The Hawaiʻi Electric Light Company announced a partial lane closure of Hawaiʻi Belt Road in Kalōpā between mile marker 38 and 39 from 7 a.m. to 10 p.m., to allow crews to replace 15 damaged transmission poles and lines that were downed by gusty winds and fallen trees on during Sunday’s storm. Expect delays of up to 45 minutes, HELCO says. Yesterday, HELCO reported about 2,000 customers in Honokaʻa and Waipunahina were without power. Also, due to the outage, the Department of Water Supply issued an Emergency Water Restriction for Honokaʻa, Ahualoa, Haina, Kapulena, Kukuihaele, and Paʻauhau. “Please conserve and limit water usage to food and sanitation needs until power is restored,” Hawaiʻi County Civil Defense said. Surf heights will be 10 to 15 feet along north facing in the morning, lowering to 8 to 12 feet this afternoon, then rising to 15 to 20 feet tonight through Wednesday. UPDATE: Beach Parks are open. “Exercise caution along shorelines and beaches,” civil defense says. Bayfront Highway in Hilo remains closed. The access road to the summit of Mauna Kea remains closed to the public above the Maunakea Visitor Information Station “due to forecasted strong and gusty winds along with below freezing temperatures and high humidity causing icy road conditions,” rangers say.